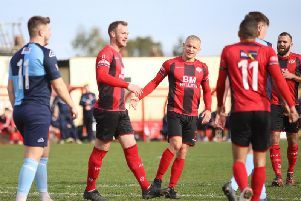 Marcus Law says the Kettering Town fans can take him “to the sword” if his team don’t gain promotion through the play-offs – but until then he has demanded unity from all sides of the club. The Poppies found themselves with an opportunity to take second place in the Evo-Stik South League Premier ahead of Tuesday night’s clash with Tiverton Town at Latimer Park. But, by the end of the evening, Law’s team had fallen to a shock 3-2 defeat and found themselves in fourth spot going into this weekend’s final game of the regular season when they entertain Farnborough. If the Poppies are to have home advantage in the play-off semi-final next Wednesday night, they will need to win and hope either King’s Lynn Town or Slough Town slip up. However, what was more concerning for Law was the outcry on social media following Tuesday’s loss, which was just their second at home in the league for his team this season. The Poppies boss is adamant that, with the play-offs on the horizon, unity is the key. And he has urged everyone to be on the same page at Latimer Park on Saturday as Kettering’s bid for promotion heads for its climax. “The remit has not changed, we have still got two play-off games to go and win,” Law said. “We slipped up on Tuesday night but who is to say others won’t slip up this weekend? “There are still three teams who could finish second and we are one of them. “But there was a great deal of negativity around after the loss on Tuesday, plenty of people, and they know who they are, are having their say on social media and I am not sure it’s what our players really need or want to be reading. “We lost at King’s Lynn and the outcry was there, we have lost on Tuesday night and the same has happened again. “I look at someone like Brett Solkhon who has given the club absolutely everything he has got over the past six games in such a short space of time. Does he really deserve to be reading some of the stuff that is being written? “We are about to enter play-off football and, after the season we have had, I think we all need to stand together. “That has to start on Saturday. We will do our bit. I will have the players fired up. “But we need to come together as one for what we are about to try to do. “If we don’t pull it off, people can be as negative as they want and take me to the sword. “But, for the time being, we need unity. We need to be together."